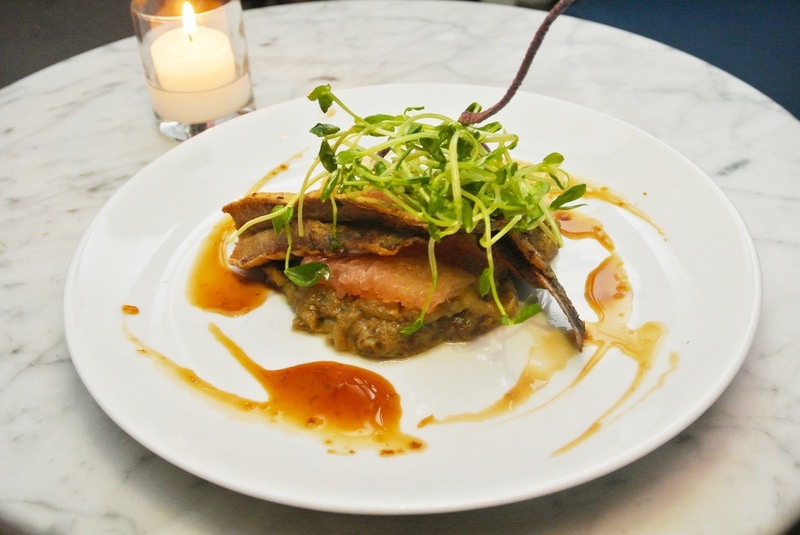 Small plates are no longer a trend. They’re here to stay. And as more and more chefs have embraced the notion the small plate offerings have only gotten better. From portabella mushrooms to modern twists on bruschetta, today’s small plates are often seasonal and bursting with flavor. Follow some of our favorite chef’s lead and make one of these springtime dishes for your next garden party. Wow your friends and family with a cool, refreshing cucumber soup. 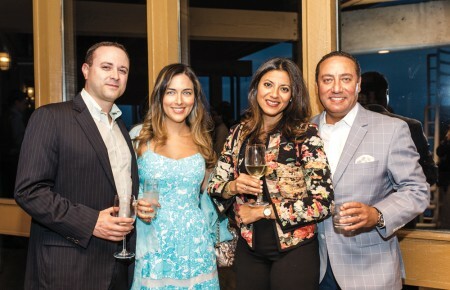 Caterer to the stars Andrea Correale serves this dish throughout spring and summer as a respite from the hot and humid weather. 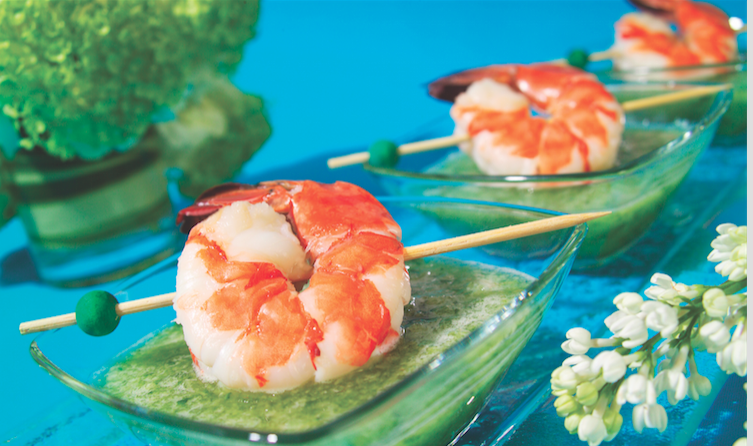 The citrus gives the soup a bit of tang and the poached jumbo shrimp adds to the sophistication factor. Get the recipe. 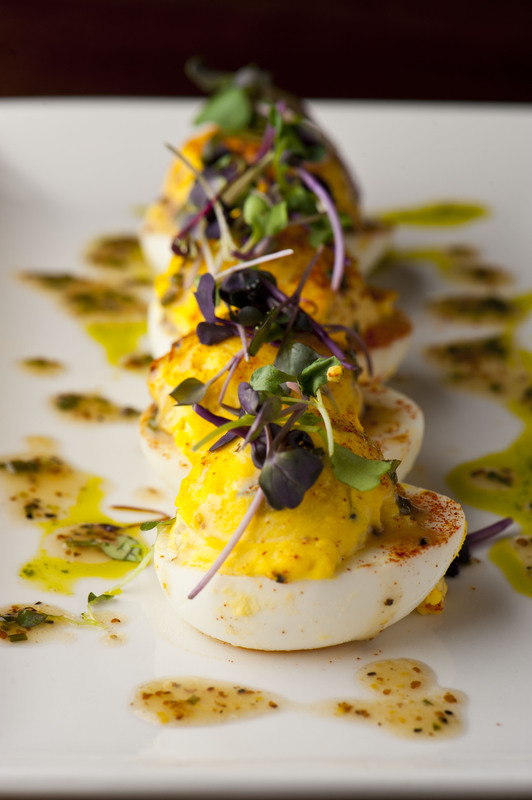 Executive chef Greg Lombardi of Del Frisco’s Grille in New York City elevates the standard Deviled Eggs dish by adding a few creative twists. Think crunchy bread, butter pickles and tangy yellow mustard for a modern American comfort dish that is as easy to make as it is delicious. A Huntington location is slated to open in July. Get the recipe. At the West Village’s intimate Upholstery Store, Kurt Gutenbrunner and Leo Schneeman are constantly redefining traditional seafood dishes. The current spring favorite is Portuguese sardines. Seasoned with salt and dusted with flour, the sardines are seared and served on a bed of eggplants with citrus vinaigrette for a small plate dish that tastes like spring with every bite. Get the recipe. Classic and simple steak tartare conjures up visions of brunch at a Parisian café. 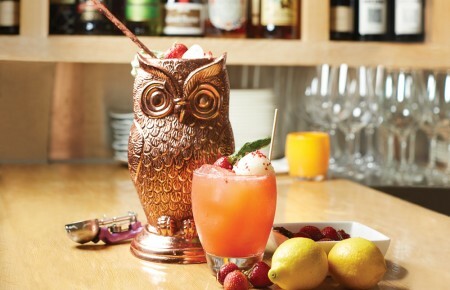 Create that feeling in your home by making American Whiskey’s executive chef Roger Jocobsen’s modern twist on the traditional. 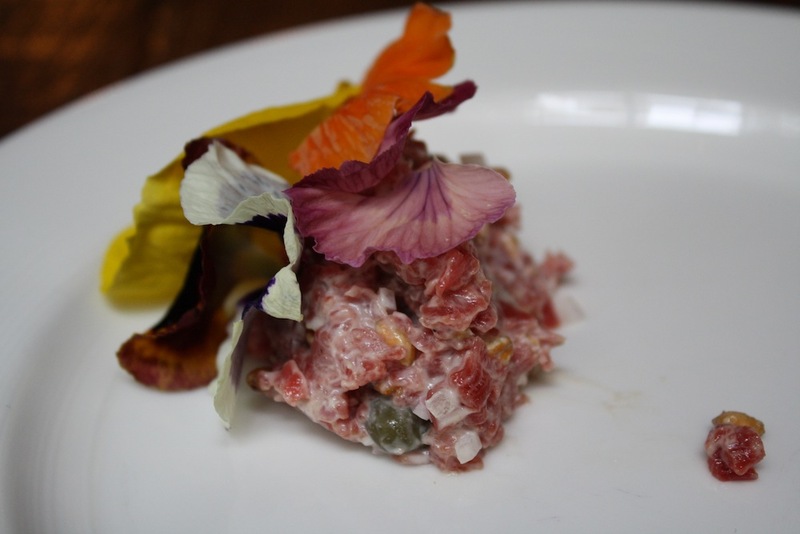 Jocobsen uses capers, shallots, puffed farro and mayonnaise in his steak tartare recipe, creating a dish with complex flavors. Edible flower petal garnish optional, but highly recommended. Get the recipe. 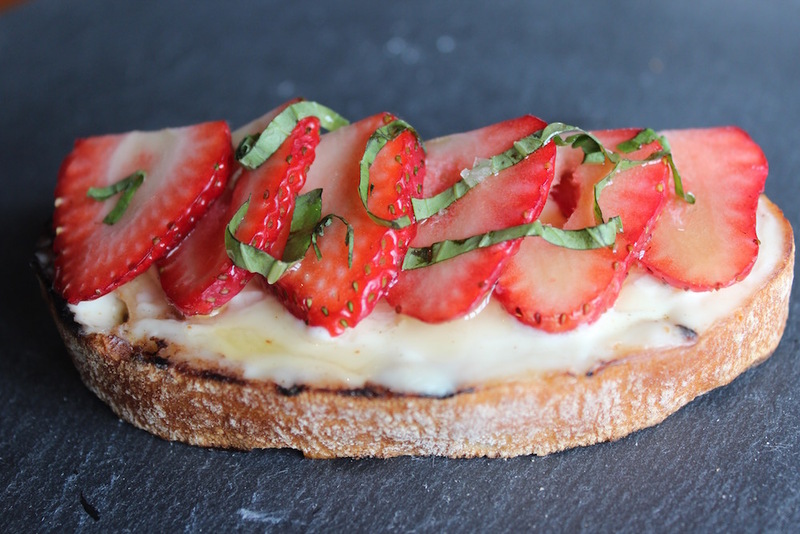 Simple and easy to make bruschetta is the ultimate small plate dish or appetizer. 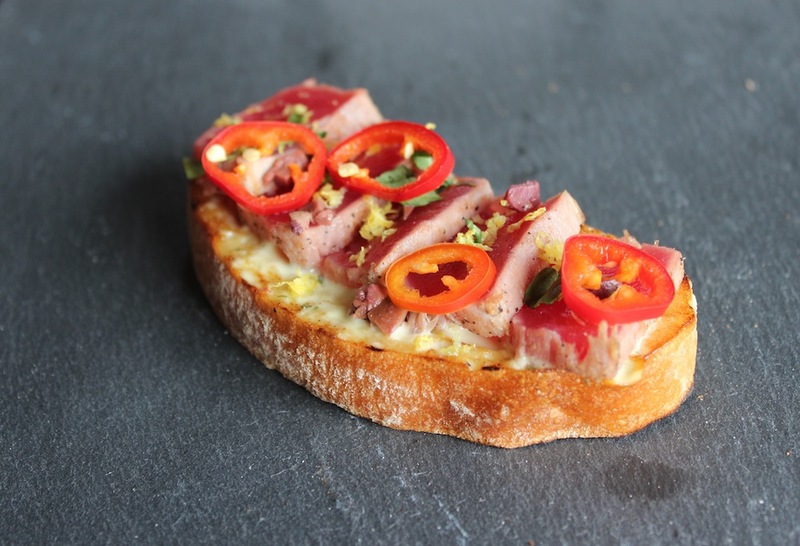 There are so many ways to make bruschetta but a favorite of Ryan Keough’s, who as the chef of Spuntino Wine Bar & Italian Tapas in Garden City is constantly creating new small plates that put modern twists on Italian classics, is this seared tuna bruschetta. The hearty seared tuna with arugula, red chili pepper and olives all on rustic toasted bread will be your new go-to dish. Get the recipe. Earthy portabella mushrooms are the stars of this small plate dish from executive chef Chris Franz of the Rattlesnake Club. 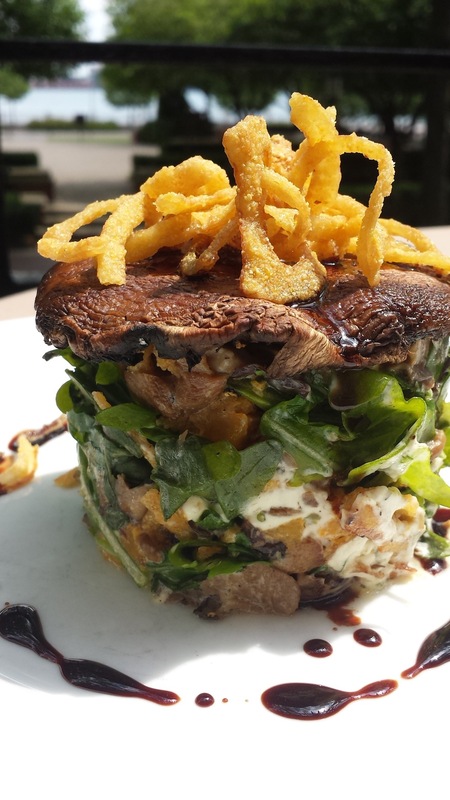 Think of it as a mushroom salad but better. The meaty, juicy portabella mushroom gives the dish a heartiness that makes it ideal for sharing while the arugula, onion and cheese have it bursting with the flavors of spring. Get the recipe. For anyone still on the fence about small plates, this sweet bruschetta recipe from Keough should seal the deal. The dessert or brunch dish takes advantage of the abundance of strawberries in the spring and uses mascarpone cheese to give a creamy finish. Get the recipe.